I recently designed a set of 7 hockey coins for The Royal Canadian Mint for 2018. Each coin representing a Canadian NHL team, with a theme of learning to play. The Fishing coin I designed for the Mint won the Most Inspirational category in Krause Publications (worldwide) Coin of the Year awards. I have completed several painting commissions. For some of these, I created the painting from phtos submitted by the client. John's blog . I take my sketchbook with me on all our travel adventures. Take a look. John Mantha is a Toronto-based artist and illustrator. Born in Sault Ste. Marie, Ontario, he graduated with honours from the Ontario College of Art. His major commissions include the design of over 30 coins for the Royal Canadian Mint, a series of works for the Ford Motor Company and the Toronto Transit Commission as well as 34 paintings for The Church of Our Lady of Good Counsel. Other clients have included Fox Television, Imperial Oil, Penguin Books, Kids Can Press, Better Homes and Gardens magazine and Cottage Life magazine. Working for book publishers, advertising agencies, magazines, corporations, television and movies, his work has been seen throughout North America. His paintings, done in oils, have been exhibited in galleries across Ontario and hang in corporate and private collections. He freelances for CTV as a court room artist. The Kids Book of Canadian Exploration was nominated for the 2006 Hackmatack Award for non-fiction. The Kids Book of Aboriginal Peoples in Canada was nominated for the BC Book Prize, and the Christie Harris Illustrated Children's Literature Prize. He has illustrated numerous books for Kids Can Press and Annick Press. 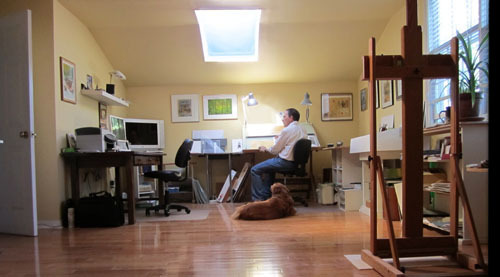 He works in oils and oil-wash and also photoshop for spot illustrations. His style is realistic in nature with an emphasis on texture. He lives in Toronto with his wife Leanne, daughter Lauren and their dog Bella and cat named Charlotte. He has illustrated, "The Siege" (check out John's blog for samples), and "The Kids Book of Canada At War" which were nominated for The Red Cedar Information Book Awards . The Red Cedar is British Columbia's Young Reader 's Choice book award. Below is a review of a recent book he illustrated entitled "The Crusades".